PPHS freshman Addy Cottrill prepares to serve during the Lady Knights victory over Poca on Thursday in Point Pleasant, W.Va.
PPHS junior Haley Mihoan prepares to serve during the Lady Knights victory over Poca on Thursday in Point Pleasant, W.Va.
POINT PLEASANT, W.Va. — There’s no place like home. 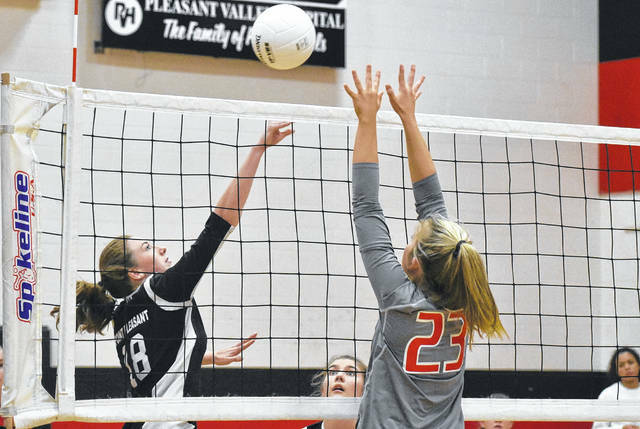 After canceling their match on Tuesday at Teays Valley Christian, the Point Pleasant volleyball returned to its home court on Thursday night, earning a 25-13, 25-12, 25-15 victory over visiting Poca in a non-conference match in Mason County. The Lady Knights (12-3) dominated the Lady Dots (3-11) in the first game, never trailing in the contest, as the hosts charged to an early 7-2 advantage, before outscoring Poca 18-11 the rest of the way to earn a 25-13 victory. The Red and Black carried that momentum into the second set, as they jumped to an early 5-0 lead. The Lady Dots, however, closed the margin to 5-4, but the hosts manufactured a 20-9 scoring run en route to a 25-13 win in game two. The third game was tightly contested initially, as the two squads played to five ties and six lead changes, before the hosts pulled ahead at 8-7. From there, Point Pleasant never again trailed, as they outscored Poca 17-8 to close out a 25-15 win and 3-0 victory. The Lady Knights produced nine aces and used two different lineups over the course of the opening two games. Point Pleasant also never trailed by more than one point during all-three sets of the contest. The Red and Black service attack was led by Olivia Dotson with 15 points, including seven aces, followed by Lanea Cochran with 11 points, including a pair of aces. Haley Mihoan was next with five service points, while Peyton Jordan and Baylie Rickard followed with three points apiece, respectively. Katelyn Smith posted two service points, as Tristan Wilson and Addy Cottrill concluded the Point Pleasant service attack with one point apiece, respectively. The Lady Dots service attack was led by Sierra Strickland with six points, as Haley Huffman followed with two points. Karah Hendrick and Autumn Pauley closed out the Poca service attack with one point apiece, respectively. As a team the Lady Knights finished with 77 digs, 18 kills and four blocks. Following the contest, PPHS fourth-year head coach Marla Cottrill was pleased with her team’s performance — particularly their ability to adapt to changes in the starting line-up. “We were down a player for this game. Our starting senior Madison Hatfield suffered a sprained ankle in practice so she was unavailable to play. Fortunately, we have a deep bench, so we had four freshman on the court tonight. Baylie Rickard stepped in for Hatfield and truly stepped up and did what she had to do. 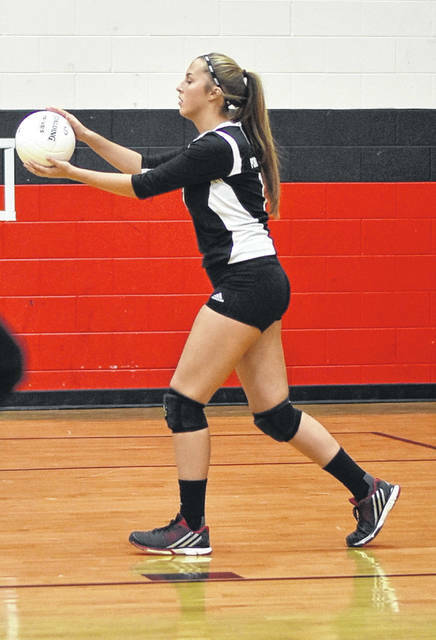 I am very pleased with her performance particularly with her passing, serving and setting,” Cottrill said. “Lanea Cochran was truly big in the middle all match. She really provided a lot for us out there on the floor tonight. Tristan Wilson was a really big hitter for us. I think it just clicked tonight out there. We always seem to have problems playing to our competition, this season we have strived to play our game and tonight we did. I’m very proud of these girls. Point Pleasant returns to action Tuesday when it travels to Ohio Valley Christian School for a 5:30 p.m. contest.